Baigan ka bhartha is a traditional Indian dish made from the roasted brinjals / egg plants / aubergines. The outer skin is peeled off after roasting them on charcoal or fire and the pulpy part is sauteed with onion and spices. These days since we don't have charcoal sigris we opt out for ovens or directly roasting them on gas flame. Garam masala ......... 1 tsp. Red chilli powder .... 1/2 tsp. 1. Place the brinjals on a wire mesh over the gas burner or in the oven till done. 2. Peel the skin and remove the pulp. 3. Fry the onions till brown. Add the tomato, green chilli and the ginger-garlic paste.cook for a few minutes adding a little water. 4. Now add the brinjal pulp and coriander, cumin and turmeric powders.Add the salt and mix well.Simmer it for 1-2 minutes. 5. In a frying pan heat a tbsp.of ghee or oil,remove from the gas and add the garam masala and the red chilli powder.Mix it with the Baigan bhartha immediately. PS: I could not find the Dubbagol voting button on this page in order to vote this story up. Thanks for the appreciation.I am glad you liked it.I learnt it from a Punjabi friend of mine.I took quite sometime to master this recipe and get the right taste.Though the ingredients are so simple .. it has to have a little burning flavour which you get by roasting the brinjals on fire. 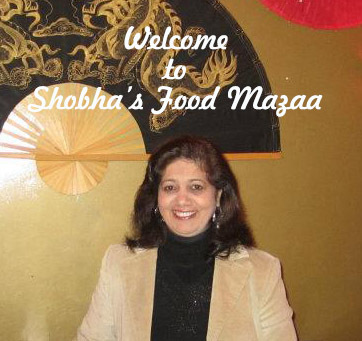 Shobha makes the most amazing dishes. Even simple dishes taste different with her. I have tasted this preparation as many many more. Am not too much of a vegetarian. But, with her touch, all dishes taste great. Her Baigan ka bharta is just too good! Try out the recipe...which is lucidly explained. Difficult to keep up with the original, though. Thanks for the compliment Pritam.. I tried this dish at home for the 1st time and oh my god, I couldnt resist until the end to taste it.... 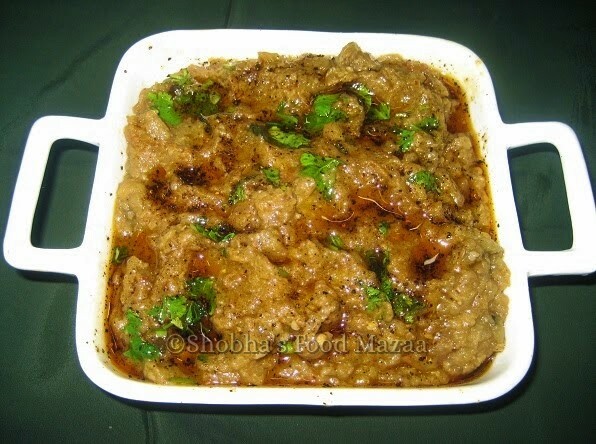 I basically love eggplant and dis recipe s just awesome:-) thanks.. Thanks Priya..I am glad ur hubby liked it....we really feel happy isn't it...when our dear hubbies enjoy and relish the food we prepare. Nice one. A different version is prepared by me.